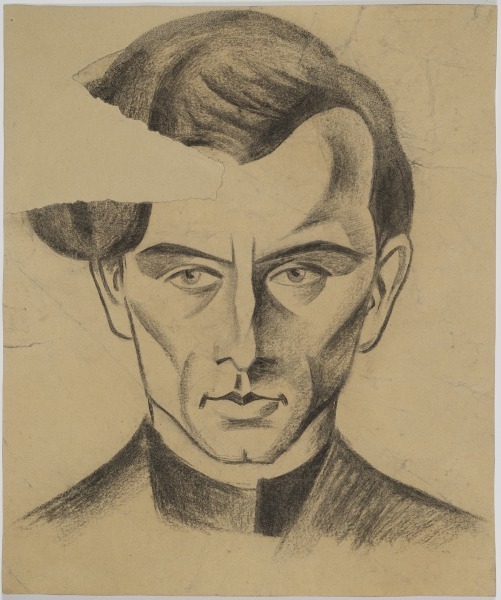 Shimshon Kahan(1905 Vilnius – 1941 Paneriai) was one of the founders of Jung Vilne (Young Vilnius, 1929–1941), an avant-garde group of young Jewish writers and artists, and editor-in-chief of the Vilner tog (Vilnius Day) daily. Theatre was yet another field of Kahan’s cultural interests in addition to literature. His avant-garde use of incompatible styles in one and the same piece of work, including his strive to distance himself from canonical literary norms, made Kahan’s poetry cognate with the works by other members of the group. Kahan spared no effort in organising the activities of Jung Vilne which made him an exceptional member of the group. His translations of Roma folklore into Yiddish broadened the horizons of Jewish literature in the Yiddish language. Painter Bencion Michtom who painted the portrait of Shimshon Kahan, was a member of Jung Vilne, too. The two artists were among the first ones who got killed by the Nazis at the very beginning of World War II. Jung Vilne started its activities on 11 October 1929 when a group of writers co-authored a publication printed in the Vilner tog daily. The publication covered poems by Leizer Volf, Shimshon Kahan, Sloime Beil, Elchanan Vogler, Aharon Piudik and Moshe Basin, and a fragment of a short story by Moshe Levin.